(Zaman Al Wasl)- A footage obtained by Zaman al-Wasl showed Russian fighter jets practicing live manoeuvres against Syrian frigate in front of Tartus coast. A well-informed source in the Syrian Navy said the Russian Navy based in Tartus base asked the regime to use one of its out-of-service frigates in its manoeuvres which took place in February 28 in the Mediterranean Sea. The source revealed that the Russia ha dasked the Syrian navy to put Petya 508/1 (Hurricane) as a maritime target, since it is no longer serviceable. The frigate belonged to the (508) vessels group, one of the most important Syrian naval vessels, which includes two Petya vessels. First frigate: SKP 508/1 (Hurricane) and the second frigate SKP 508/2 (The Guard). 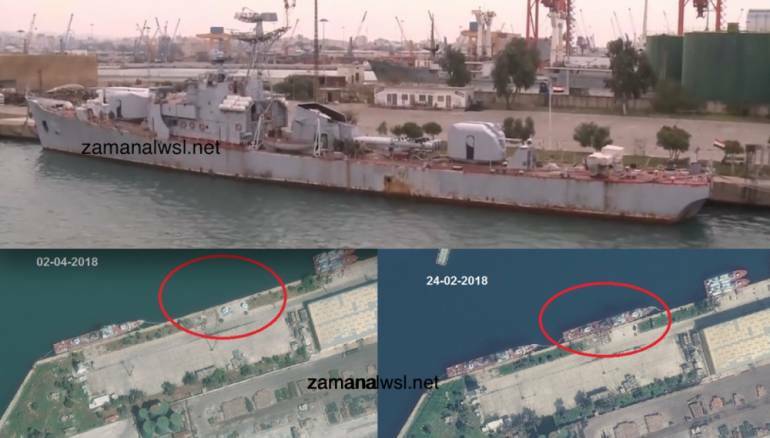 Zaman al-Wasl obtained exclusive reports leaked by group of army officers, who still in duty showing how the corruption has swept the Syrian navy. Since the established of Syrian navy in 1950, no role has been remembered as its role in bombing the Syrian people over the last seven years. Even during the 1973 Arab–Israeli War in 1973, the navy participation was so restricted. On the contrary, the Israeli Navy sank five Syrian naval ships without a loss during the Battle of Latakia. As a result, the Syrian Navy remained in port the rest of the conflict. In 1996, the last Syrian submarine was sold as scrap to Assad's uncle Mohamed Makhlouf who gained a fortune of it. In 1961, the Syrian regime received three Romeo 633 submarines and Romeo 613 cargo submarine from Russia. The old-fashioned submarines were all out of service by mid nineties as Russia said these submarines were no longer safe for diving. At the time, the naval forces did not sent the submarine back to Russia to reconstruct as Egypt did with its submarines. for $141,000 (6 million Syrian pound) such a cheap price followed preventing Syrian businessmen from entering the auction. The weight of each submarine is 1850 tons (3700 tons for two submarines) 3.700.000 kg. Each kg equaled 6 Syrian pounds (14 cent). The total profit of Makhlouf was $518,000 in addition to 10 kg of white mercury and two large diesel engines with huge capacity. Makklouf won the auction for just $120,000. Later on, the 'white mercury' had been stolen from the office of Colonel Ali Baso in the Navy 56th Brigade. The case is still ambiguous ever since. For the last two decades, Makhlouf family has become the economic arm of the Assad's family. Makhloufs have dominated Syria's auctions, deals and tenders. Financial analysts say Bashar's cousin, Rami Makhlouf, has lessen the burden of the seven-year-old war and the International blockade on the Syrian regime. In 1996, Commander of the Syrian Navy tried to ease the inner-circle critics over 'Makhlouf profits' by delivering the other two out-of-service submarines to the Armored Vehicle Base northeast of Damascus to get use of its scrap. Such a move produced another corruption cell where most of the submarines' scrap was stolen and disappeared.